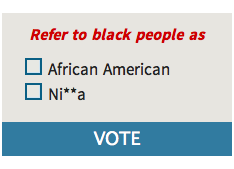 TMZ poll asks how to "refer to black people"
Today's disgusting piece of racist garbage comes not from trick-or-treating idiots or Fox News or the ghost of Jefferson Davis, but from celeb gossip site TMZ, which is asking, in 2013, what to "refer to black people as." Unfortunately, TMZ then launched into that whole "white people should be able to say the N-word too" debate and wrote, "At first his theory sounds a little shocking, but maybe he has a point. So we gotta ask ..."
Actually, as Global Grind writes, "you don’t have to ask." I refuse to participate in this poll and hope to remain unaware of the results; that lady in the photo above is basically me at the Internet today, so thanks, TMZ.